Flow cytometry panel design has become increasingly complex as cytometer technology enables larger multi-color flow cytometry panels. Researchers often spend hours scouring antibody supplier catalogs for data on antibody titration, antigen density and spectral analysis. Fortunately, FluoroFinder’s flow cytometry panel builder tool automates the panel design process enabling scientists to build better panels faster. Get started using the automated panel builder. How will FluoroFinder Accelerate Your Research? Try the panel builder now! 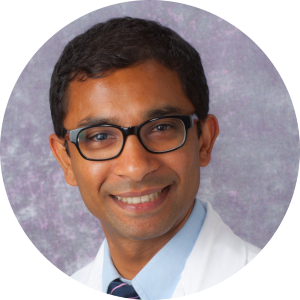 Shrinivas Bishu, MD, is a gastroenterologist at the University of Michigan who splits his time equally between research and the clinic. His specialty is Crohn’s disease and ulcerative colitis, collectively called inflammatory bowel disease (IBD). Dr. Bishu is currently studying tissue resident memory t cells and the transcription factor IRF5 in maintaining Gastro Intestinal (GI) homeostasis using Citrobacter as a model. Patients with hyper-functioning IRF5, a known IBD risk allele, have increased production of IL-23 and IL-12 which drives the pathogenic t cell response that predisposes them to colitis. Dr. Bishu’s ultimate goal is to identify patients who will benefit from targeted therapy. He has used FluoroFinder many times to efficiently build complex multicolor panels that are customized to work with the UMich cytometers. Dr. Bishu is also able to easily spread his fluorochrome choices across different lasers and minimize compensation complications using the multivendor SpectraViewer.